With the new iPad 2 coming in a few days, there are going to be a lot of used first generation iPads for sale. There are a few options to go with personally I went with Gazelle since they give you a locked in price for 30 days but people are getting some good money though Ebay and Craigslist as well. Lets get into how to prepare an iPad for sale. If you’re planning on buying an iPad 2, you’ll probably want to save your apps, settings and other data from your current device. It’s extremely easy to do plug your iPad into your computer and let iTunes perform a sync. If you want to be doubly sure that the latest version of everything is definitely backed up, you can right-click the device in the iTunes sidebar and choose Back Up. iTunes stores these backups forever, even if you restore the device and sync it again, so don’t worry about losing anything when you get a new device. Once you’ve got a backup of everything stored on your computer, it’s time to reset your iPad back to how it was when you opened the box on day one. In iTunes, click the name of your iPad in the sidebar, then click on the Summary tab if it’s not already open. Now click the Restore button. 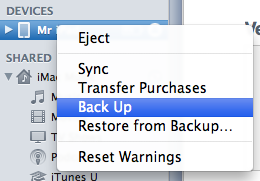 If iTunes asks if you want to restore from a backup, choose No, since you want everything wiped. Let iTunes run through the restore process, then when it’s done your iPad will be just like new again. Just unplug your device when you finish instead of going through the new device setup process. Your iPad’s new owner won’t be too happy if they open the box to find a dirty device covered in fingerprints. Smudges on the iPad’s screen are inevitable, since it’s a touchscreen device, but you should wipe them off before giving your device away. Once you’ve done all of the above, your iPad is ready to be passed on to another user who will hopefully take good care of it.